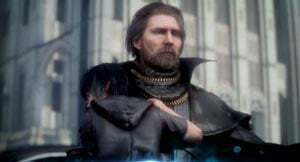 Regis Lucis Caelus is a Character in Final Fantasy XV. The reigning monarch of the Kingdom of Lucis, Regis raised his son, Prince Noctis, on his own. For long years, he has sustained the Wall, a magical barrier that encases the Crown City, protecting it from invasion. However, tragedy would befall him at the treaty signing with Niflheim, during which he was reportedly slain.